Born: 1858, Nottingham, United Kingdom. Died: 5 September 1942, Vereeniging, South Africa. Thomas Nicholas Leslie lost his parents at an early age and left school at the age of eleven to earn his keep. Initially he worked in a brickworks, but was subsequently apprenticed to a builder where he learned masonry and brickwork. He came to South Africa in 1881 as a young man of 23 and worked as a building foreman in Pretoria for some time. He then travelled via the Witwatersrand to Kimberley, Bloemfontein, Barkly West, Lichtenburg, Rustenburg and back to Pretoria, building and prospecting for diamonds in various places. From 1885 to 1891 he remained in Pretoria as a stonemason, but in 1892 settled in Vereeniging in the same trade. There he remained for the rest of his life, playing a significant role in the town's rapid development. Among others he was a member of the town's Health Board - the first local government body - and its successor, the Urban District Board, of which he became chairman. When Vereeniging became a municipality he was elected a member of its first town council, serving as mayor from 1904 to 1917 and again from 1926 to 1929. On two occassions he was elected president of the Transvaal Municipal Association. He also played an active role in local education, serving as chairman of the committee of Selborne School for 30 years, as a member of the governing body of King Edward VII School, and as a member of the Technical College Council. He started the town's first public library in his own house, mainly with his own books. In a lecture delivered to the Workers' Educational Association he spoke on "The waste of efficiency in South Africa" (Vereeniging, 1915, 16p), while another lecture by him dealt with "Poverty and unemployment" (Johannesburg, 1915, 14p). Despite his busy public life Leslie actively pursued his interests in the natural sciences. He made an extensive collection of fossil plants, particularly the flora associated with the coal measures and their associated rocks in the neighbourhood of Vereeniging, and eventually became an authority on the subject. Most of his specimens came from a sandstone quarry on the Klip River close to its confluence with the Vaal River, and a sandstone bar across the Vaal River just south of Vereeniging. Specimens were sent to Professor Albert C. Seward* of Cambridge, who described them in various publications. Leslie met Seward on a trip to England during the Anglo-Boer War (1899-1902). His first paper on "The fossil flora of Vereeniging" was published in the Transactions of the Geological Society of South Africa (Vol. 6, pp. 82-88) in 1903. By this time he was able to identify his own specimens and criticised the excessive use of synonyms in the literature. A major discovery by him was a site in the bed of the Vaal River, later submerged by the waters of the Barrage, with many fossilised tree roots and stems of up to fifteen meters long. The find was described by E.T. Mellor* and Leslie in a paper "On a fossil forest recently exposed in the bed of the Vaal River at Vereeniging" (Ibid, 1906, pp. 125-128). A third paper on his work was written in collaboration with Seward. In 1907 he presented a collection of fossil plants from Vereeniging to the South African Museum in Cape Town, and the next year another collection to the McGregor Museum in Kimberley. His work contributed considerably to the unravelling of the correlation of the coal bearing strata throughout South Africa, and for many years geologists came to his house in Vereeniging to become acquainted with the flora of the Ecca Group. Leslie's scientific interests extended also to living plants, and in particular the collection and cultivation of indigenous succulents. Specimens were sent to Mrs H.M.L. Bolus* in Cape Town and to the British botanist N.E. Brown*. He discovered a new "window plant", Lithops lesliei, also another new succulent, Argyroderma lesliei, and the shrub Thesium lesliei, all of which were named after him by Brown. An article by Leslie on "Rare Karoo plants and their cultivation" was published in the South African Journal of Natural History (Vol. 6, pp. 108-115) in 1927. He also made a series of photographs of South African succulents, exactly to scale, and these have been used to illustrate various botanical publications. A display of these photos at the Empire Exhibition in Johannesburg in 1936 received an award from the Johannesburg Photographic Society. In 1903 Leslie started regular meteorological observations with the help of his three sons. The observations were supplied to the recently established Transvaal Meteorological Department (at the Transvaal Observatory), headed by R.T.A. Innes*, and were also summarised by Leslie in two short articles on "Vereeniging meteorological records" in the Transvaal Agricultural Journal (1903). His photographic skills found further expression in an impressive series of photographs of clouds and lightning, including the spectrum of lightning flashes. He was still a meteorological observer (of rainfall, atmospheric pressure, air temperature and humidity) for the Transvaal Observatory in 1908/9. Another of his interests was archaeology. With his young sons he found many Stone Age sites on the Vaal River terraces near Vereeniging. He accumulated a sizeable collection of stone artefacts and published a short paper on "The Stone Age industry of Vereeniging" in the South African Journal of Science (1926, Vol. 23, pp. 867-868). He also photographed, and probably removed, a prehistoric rock engraving from the Redan site near Vereeniging. Another of his publications was a "Note on the Dolomite as a source of refractory material" (Ibid, 1924, Vol. 21, pp. 159-161). On the basis of his scientific work the University of the Witwatersrand awarded him an honorary Doctor of Science degree in 1930. Leslie became a member of the South African Philosophical Society in 1901 and remained a member for many years after it became the Royal Society of South Africa in 1908. 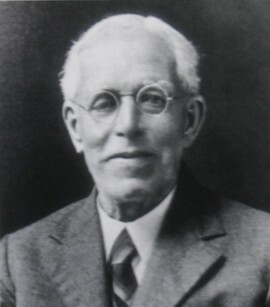 He joined the South African Association for the Advancement of Science in 1903, the year after its formation, serving as vice-president in 1926. Three years later he was elected an honorary life member. In 1898 he joined the Geological Society of South Africa, serving on its council from 1911 to 1934 and as president in 1920. His presidential address dealt with "Observations on some fossil plants from the Permo-Carboniferous". He was also a member of the South African Geographical Society. By 1905 he was a Fellow of both the Geological Society of London and the Royal Meteorological Society. He was a fine example of an amateur scientist who, without formal higher education, made significant contributions to South African science. Leslie was married to Jane Mary Clifton. Anhaeusser, C.R. (ed.) A century of geological endeavour in southern Africa, 1895-1995 (pp. 15, 126). Johannesburg: Geological Society of South Africa, 1997. Cape of Good Hope. Report of the Alexander McGregor Memorial Museum, Kimberley, 1908. Cape of Good Hope. Report of the trustees of the South African Museum, 1907. Geological Society of South Africa. Transactions (and Proceedings), 1899, Vol. 4; 1903, Vol. 6; 1906, Vol. 10; 1915, Vol. 18; and 1920, Vol. 23: Papers and lists of members. Journal of the South African Geographical Society, 1917, Vol. 1(1), list of members. Kovacs, I. Redan petroglyphs. The Digging Stick, November 1998, Vol. 15(3), pp. 10-11. National Automated Archival Information Retrieval System (NAAIRS). http://www.national.archives.gov.za/naairs.htm Documents relating to Thomas Nicholas Leslie / T.N. Leslie. Obituary: Thomas Nicholas Leslie, DSc, FGS, FRMetS. South African Journal of Science, 1943, Vol. 40, pp. xxi-xxii. Phillips, E.P. A brief historical sketch of the development of botanical science in South Africa... South African Journal of Science, 1930, Vol. 27, pp. 39-80. South African Association for the Advancement of Science. Report, 1904, 1905/6, 1910, 1918: Lists of members. South African Journal of Science, 1924, Vol. 21; and 1926, Vol. 23: Papers by Leslie. Transvaal Agricultural Journal, 1903, Vol. 1-2. Transvaal Colony, Meteorological Department. Report, 1902/3,1904/5, 1907. Transvaal [Colony]. Transvaal Observatory: Annual Report of the Meteorological Department for the year ended 30th June 1909. Pretoria: Government Printer, 1910.